We love a good beauty product...from hair products to make up and everything in between. We've been known to spend a lot money on beauty products, but a the same time some of our very favorites are items that just cost a few dollars. 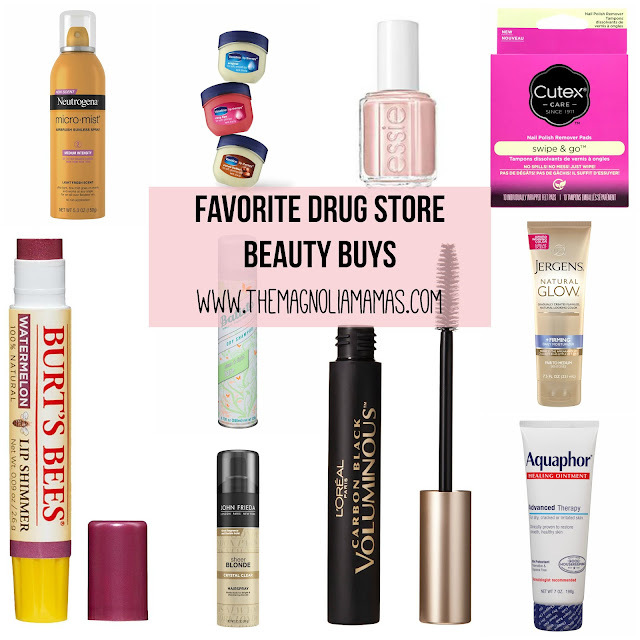 We don't discriminate when it comes to the type of beauty products we use, so today we are focusing on some of our favorite drug story beauty products. These are items you can get just about anywhere...Target, Walmart, CVS, Walgreens and Amazon. Sheer Blonde Hair Spray - I picked up this hairspray on a total whim at the grocery store and fell in love it it. It's really light weight and holds my curls, but doesn't feel sticky or heavy at all. Batiste Dry Shampoo - I've tried lots of brands and for the price, this is my very favorite! It comes in a ton of different scents, but I love the bare one best. It just smells so fresh and clean! L'Oreal Mascara - Best mascara in my opinion. It has build-able coverage so if you just want a little on one swipe will do, but if you want more of a dramatic eye, just put on more coats. L'Oreal eyeliner - This eyeliner goes on so easy and smooth! Vaseline Lip Therapy - After having some serious lip allergy reactions going on with various chapsticks and lip products, this was recommended to us by a dermatologist and to this day we won't use regular chapstick. This comes in a few varieties and we have them all! Burts Bees Lip Shimmer - See above! Because of the months of pain and discomfort I went through I was scared to use anything on my lips. This is a nice mix of moisturizing and color and never dries my lips out. It is like a sheer lipstick. It comes in a ton of colors and I have a bunch of them, but my favorite is Watermelon. Coconut Oil - Good old fashioned coconut oil! I buy it on the oil aisle at the grocery store. I keep thinking I will do a post on this, but haven't gotten around to it yet. There are SO many uses for it, but I keep a jar in my bathroom and use it to take off my eye make up every single night. It is the BEST makeup remover. It also works to get off things like eye-black (what baseball players wear under their eyes) when nothing else will work! Sounds weird, but trust us! Neutrogena make up wipes - When we are lazy and tired at night and don't want to wash our faces, these come in handy! Essie Nail Polish - Our favorite nail polish because it comes in so many fun colors! There is nothing better on a random Monday grocery shopping trip than throwing a new fun color in our buggy. Cutex Swipe & Go Nail Polish Remover Wipes - These are the best! It's like a gauze/felt pad soaked in nail polish remover. One pad will take off nail polish on both hands! They are so great for around the house, but even better for traveling when you can't bring bottles of liquid more than 3 oz. on a plane with you. Aquaphor Advanced Healing Lotion - Good ol' Aquaphor. We use this stuff for everything! Dry, irritated skin is the worst this time of year so we love to lather up with this. We use it on our kids and on ourselves. Jergen's Natural Glow Firming Lotion - We've been using this stuff for years!!! It a moisturizing lotion that very slowly and very gradually builds color. It is great to start using in the winter because when spring arrives, you have a nice healthy glow. Neutrogena Tanning Spray - Reviews are mixed on this, but we love it. It's like getting an air brush tan in the comfort and modesty of your own bathroom. The spray makes it go on evenly and the color is gradual if you follow directions and avoid ankles, elbows, and knees. Tip - We put down an old towel before spraying ourselves and make sure it dries completely before putting on clothes. Do you have any favorites? Please share because we love trying out new stuff!